Before we consider the criteria and options for your ideal whole house surge protector, we need to know what power surges are and why you need a power surge protector. Wall sockets in the US provide 120 volts of electricity, while in the UK the standard system voltage is 240V. It’s quite usual for voltage to rise and fall in a rhythm of peaks and lows but well within a predetermined tolerance band. Correspondingly, appliances are designed to work at an input voltage of 110-120V in the US and 220-240V in the UK. A power surge occurs when something (lightning, power grid factors, power outages, and the on-and-off cycles of large appliances inside the home) causes a sudden spike in the supply of electricity in the system. This spike increases the current flowing to wall sockets and into devices with voltages that far exceed the normal threshold. Modern devices with control boards and sensitive electronics are most vulnerable to surges. Massive power surges often lead to overheating and fire, and lest you think that smaller ones are safe, well, you’re wrong. Through repeated occurrences, they steadily wear down the circuitry in your appliances, affect their integrity, and shorten their lifespan. That’s the reason why you need a power surge protector. It eliminates overvoltage by diverting it to the ground wire and by dissipating and absorbing heat energy. Not all power surge protectors are created equal, though. Different types provide different levels of protection. The one we’re interested in is the whole house surge protector. How does a whole house surge protector work? You’re probably familiar with the Type 3 surge protector. It’s that surge strip you use to protect your computer, TV, and other smart devices. It provides some level of protection to devices connected to it; thus, it’s also called a point-of-use surge protector. On the other hand, a Type 2 surge protector is a whole house surge protector. It is also called a service entrance surge protector or suppressor because it is mounted on the main service entrance panel. This type reduces unwanted voltage before it even enters your home. It protects all devices in the circuit, including light and fixtures that you don’t plug into sockets or surge strips. We’re not going to touch so much on Type 1 surge protectors, but it’s worth mentioning that there are three stages in the tiered approach to surge protection. Type 1 is your home’s first line of defense. It reduces overvoltage originating from the grid even before it reaches the service panel. UL stands for Underwriters Laboratories, a nationally-recognized testing laboratory. It ensures the safety and performance of products in their lists. A product listed under UL 1449 (3rd edition) means that it meets the UL standards for surge protection devices (SPDs). Other independent organizations that provide testing, regulation and certification for SPDs are MET Labs, CSA, and Intertek. Tips: Examine the marks of accreditation. If the product you’re buying has a CSA mark, but you intend to use it in the US, make sure that it is the CSA logo with “US” mark. This shows that CSA has certified its use in the US. The same is true when buying a product bearing a UL mark with the intention of using the product in Canada. Look for the UL logo with “C” mark. MCOV is the maximum steady voltage that each mode of the SPD can withstand without catching fire. Ideally, the MCOV must be 15-25% higher than the nominal system voltage of all protection modes supported. For example, an SPD with a nominal voltage of 120V/240V must provide an MCOV of at least 138V (120V * 1.15) for line-to-neutral (L-N), neutral-to-ground (N-G), and line-to-ground (L-G) protection modes, and an MCOV of at least 276V (240 * 1.15) for line-to-line (L-L) mode. VPR is also called clamping voltage, let-through voltage, or suppression voltage rating. It is the voltage that the SPD lets through to your devices whenever a surge event takes place. You may also think about it as the voltage that will trigger the SPD to start diverting or shunting a surge. – Compare the VPR of two (or more) SPDs on the same mode. For example, SPD 1 has a VPR of 400V for the L-N mode, make sure that you compare it with SPD 2’s VPR for the L-N mode also (not with L-G, N-G, or L-L modes). – The lower the VPR, the better. The MSCC, also called surge rating, represents the maximum surge current (in kA) that the SPD can handle. Note: The most commonly experienced surges are less than 10kA. So why would you spend more for an SPD with MSCC higher than 10-20kA if surges of high-magnitude are highly unlikely? Here’s why: The protective components of an SPD degrade with every surge that they encounter and shunt. So a higher MSCC means a longer lifespan for your surge protector. The manufacturer may not always indicate the MSCC, and may only list the nominal discharge current or l2. The I2 is the peak value of the current that the SPD can withstand and still be functional after 15 impulses. 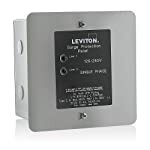 This number represents the maximum level of short-circuit current that a surge protector can withstand and safely disconnect from. A mode is a potential path for diverting a surge. The SPD should offer protection for L-N and N-G modes at the minimum. Many SPDs now protect all four modes (including L-G and L-L). When installing outdoors, look for enclosures rated NEMA 3R, 4, or 4X. These are suitable for indoor or outdoor installation. Also, consider weather conditions and other factors in your environment. Response time is not always listed, but if you can find it (usually from the manufacturer’s website). Surges occur rapidly, often lasting for only a few microseconds, so your SPD has to be as quick. Again, when comparing models, SPDs with shorter response times are better. Energy capability (energy absorbed or diverted), also called joule rating, is often provided but this is not as important as VPR, MCOV, and MSCC. The indicator is usually a small LED light that shows whether your SPD is working or not. It can also be an alarm that gives a long beep to signal that the SPD has stopped working. Compare warranties for different products to see what is covered. It will also be good to know how to file claims. For instance, the fine print often specifies conditions for claiming, e.g., the device has to be installed by a technician, or you need to have a permit for installing. Don’t be lured by a very attractive warranty if claiming for the coverage will be a problem for you. We reviewed several SPDs and came up with 5 products that impressed us. All 5 models are Type 2 SPDs per the UL 1449 3rd edition list. Here are the products that made it to our top 5 best whole house surge protectors. Our comparison focuses on the specs that we consider most critical, namely, MCOV, VPR, MSCC, SCCR, and modes of protection. Since these are technical and quantitative, we think that the best way to size up the devices is to compare them side by side in tabulated form. As a result of our assessment, we’ve already ranked the SPD models as they were listed (1 to 5) above. With the tabulated comparison, it’s quite easy to see how each fared. The MCOV on the L-N and L-L modes are equal for the 5 models. For the other modes (L-G, N-G), Intermatic and Schneider edged Siemens and Eaton. We also note that Leviton’s MCOV reflects its rating for the L-N and L-L paths being the only modes it protects, but we’ll go into that shortly. Siemens has the lowest VPR in all four modes which makes it our number 1 in this criterion. VPR should always be weighed with MSCC because it shows how capable the device is at enduring large surges (MSCC) and yet still be able to suppress overvoltage and let through a much lower voltage (VPR). Siemens again leads with the highest MSCC at 140kA. Eaton is about 30% lower. 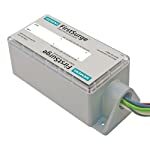 Intermatic has a 20kA nominal discharge current, so we rank it with Eaton. Though trailing behind among the 5, we think Schneider and Leviton are still way ahead of most products in the market today. Highest SCCR comes from Siemens and Intermatic. The three other models are far behind. The first 4 models protect all modes. Leviton protects only two, clearly losing this round to the others. Aside from the quantitative criteria, there are other specs that we left for you to evaluate. What are these? Enclosure type – you’re the best person to know where you’re going to set the device up, whether indoor or outdoor. Warranties – as we have stated above, find out first what the fine print says. Response time – we’ve left this out of the equation because not all manufacturers publish this detail. The industry has yet to come up with standards for testing procedures and pass/fail criteria for response time. Suffice it to say that SPDs are designed to respond within a few nanoseconds of a surge. Notification – all models reviewed have a notification feature, and it’s up to you to decide which one you prefer. Dimensions – find out how the device fits in or on your panel. We’ve provided those details and filled them in the table below to make it easier for you. Comment Top of the line. 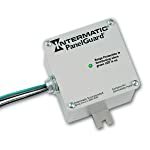 Works with any brand of single-phase panel. Inexpensive. Easy to install. Inexpensive. Easy to install. Compact. Easy to install. Customizable installation of removable modules for cable, Ethernet, and telephone. Compact and sleek look. Only 2 modes of protection. We’ve created a complete guide for whole house protection using Type 2 SPDs. It is designed for surges entering the service panel from the main and for those generated within the house. For this to be truly “whole house” protection though, you must realize that a Type 2 surge protective device alone is not enough. You need to implement a cascading level of defense against surges. Type 1 is your home’s first line of defense against a power surge from the grid. Type 2 is responsible for surges that get through Type 1 and those generated inside your home by appliances. It also protects lights and equipment that cannot be connected to surge strips. Speaking of surge strips, these are your third line of defense or Type 3 protective devices which safeguard appliances at the point of use. Finding the right whole house surge protector is an important decision. We hope we were able to help you make your choice a whole lot easier.